The house-Museum of V. I. Lenin. Director of the Museum Hadicha Muhamedovna.. The children in the house-Museum. Kazan state University im. V. I. Lenin. The streets of the city of Kazan. The building of the national library. 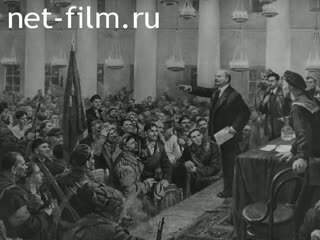 V. I. Lenin. Mohamed Ziyatdinovich Ziatdinov in the field. An excerpt from the play "Mysticly cache" ("Man with a gun"). People's artist Abdullah Shamukov in the role of V. I. Lenin.